Nimrod R1 XW666 was jokingly referred to by some personnel on 51 Sqn as ‘The Beast’ or ‘Damian’, because of the ‘satanic’ connotations of the number 666. Unfortunately, on 16 May 95, during an air-test, following a lengthy stay at the Nimrod Major Servicing Unit at Kinloss, a starter motor blew itself to bits and the debris punctured the wing and fuel tanks. A catastrophic fire broke out which was so severe that there was every likelihood the main spar holding the wing onto the fuselage would burn through and fail. The pilot of the aircraft, Flt Lt Art Stacey, had no choice but to carry out an immediate ditching in the Moray Firth from which all the crew survived. The aircraft was later recovered and scrapped. When 192 Sqn was re-numbered 51 Sqn on 21 Aug 58, attention soon turned to identifying a replacement for the 3 venerable Comet R Mk2’s which would approach the end of their useful lives by the early 1970’s. Air Staff Requirement 389 was issued detailing the characteristics required for a SIGINT aircraft to replace the Comets. 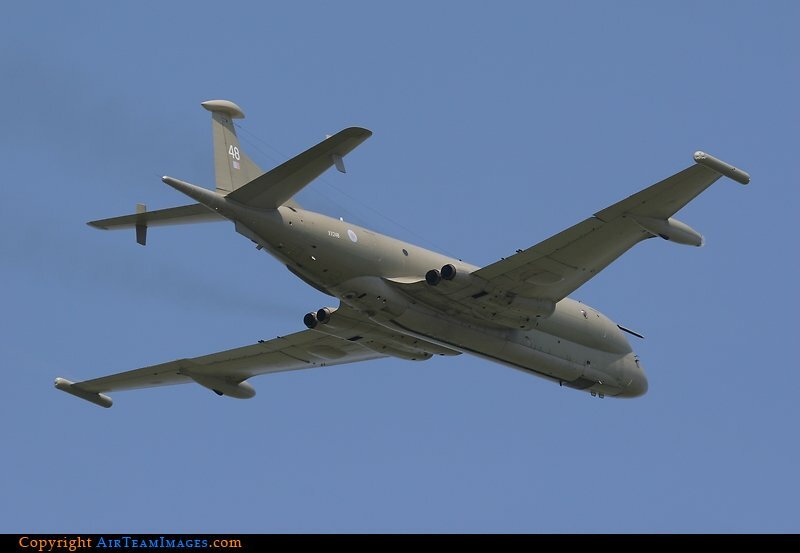 It was quickly apparent that the flexibility required for ASW operations made the aircraft ideal for gathering electronic intelligence and procurement staff soon focused on the HS 801 Nimrod Anti-Submarine Warfare (ASW) aircraft being purchased for the RAF. 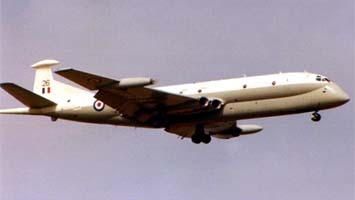 On operational sorties the Comet R Mk2 often operated in conjunction with a 51 Sqn Canberra, however, the flight characteristics of the Nimrod also allowed this aircraft to operate without a supporting aircraft allowing additional savings. In 1969 3 Nimrods were ordered for 51 Sqn, initially as HS 801Rs, but later changed to Nimrod R1s. The cost of developing the 3 specially configured aircraft was estimated at £2.38m with production costing £11.34m. Additional special equipment accounted for £1.25m and additional COMINT equipment (magnetic tape recorders, TR1986/1987 and R216 receiver replacements, and aerial distribution system and auto voice indicator) added an estimated £545k. Although the airframe of the Nimrod R1 is essentially the same as the Nimrod MR1 ASW variant, internally the aircraft are completely different, apart from the flight deck area. Because of the sensitivity of the equipment involved, the aircraft were delivered as essentially empty shells to RAF Wyton where they were fitted out. The flight deck area consists of 5 crew (2 pilots, 2 navigators and a flight engineer) but additional space is available for 2 supplementary crew to provide relief on long sorties. Accurate navigation is essential and the aircraft were fitted out with AD360 ADF, AD260 VOR/ILS, AN/ARN-172 TACAN, AN/ARA-50 UFH DF, LORAN, and a Kollsman periscope sextant. The ASV-21D radar from the ASW variant was retained with a 32in diameter dish, but provision was made for an antenna up to 5ft. Up to 23 SIGINT specialists are accommodated at 13 side facing equipment consoles in the fuselage; console 1-5 are located on the port side with consoles 6-13 on the starboard side. Each console was designed to accommodate two 4ft modules with provision for a single seat placed centrally but able to slide on transverse rails. Consoles 1-4 and 9-12 had provision for a pair of side-by-side seats. Three forward facing single-man consoles now augment these double consoles. The first Nimrod R1, XW664, was delivered to Wyton on 7 Jul 71 and took over 2 years to fit out. The first training sortie (Captained by Flt Lt Gordon Lambert) was flown on 21 Oct 73. The first operational sortie was flown on 3 May 74 and the type was formally commissioned into RAF service on 10 May 74. Two more Nimrod R1’s entered service during late 1974, XW665 and XW666, allowing the retirement of the last Comets and Canberra’s. For pilot training 51 Sqn also received a standard Nimrod MR1 (XZ283) on 8 Apr 76; this airframe stayed with the squadron until June ’78 when it was returned to BAe for conversion to AEW3 standard. Another Nimrod MR1 (XV252) then briefly acted as the trainer until the squadron reverted to the 3 operational aircraft. In 1980 the aircraft were upgraded by replacing the ASV21 ASW radar with an ECKO 290 weather radar displaying in the cockpit this allowed the radar navigator crew position to be removed. The workload of the single navigator was improved by removing one of the LORAN sets and replacing it with a Delco AN/ASN-119 Carousel IVA INS. As a result of this upgrade one of the LORAN external aerials was removed and a variety of other external antennae appeared, believed to be used for direction finding. 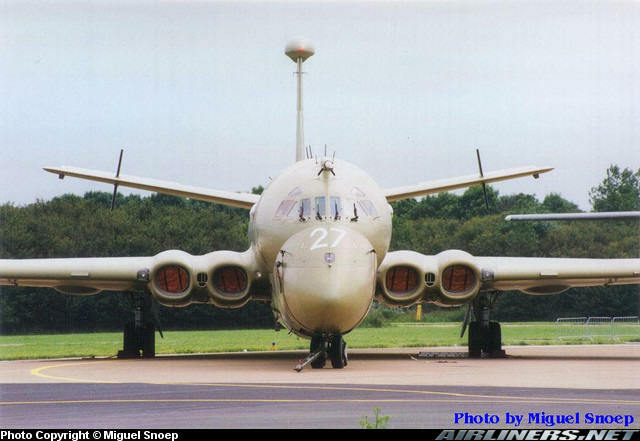 Wingtip pods, similar in appearance to the Yellow Gate Electronic Support Measures (ESM) fitted to the Nimrod MR2 also appeared on XW664 and then the other 2 aircraft. The requirement for in-flight refuelling became apparent as a result of Operation Corporate, the plan to recapture the Falkland Islands following the Argentinean invasion in 1982; however, the probes were not actually fitted until after the conflict was resolved. Along with the refuelling probe each aircraft also gained a large ventral fin, overwing vortex generators and rectangular tailplane finlets. Underwing pylons were also fitted at the same time and these now carry a modified BOZ pod believed to contain a towed radar decoys. It is believed the aircraft is now also fitted with a Marconi Master satellite communications system. 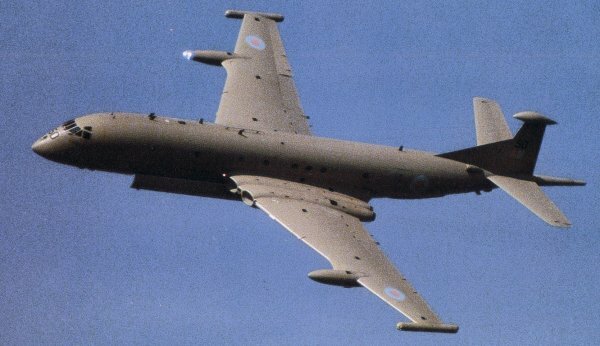 The Nimrod R1 used during Op Corporate was XW664, where the aircraft operated from during the conflict is open to speculation, but some sources believe the aircraft operated from a base in Chile alongside a detachment of RAF Canberra PR9’s. In 1995 51 Sqn finally left RAF Wyton after 32 years in residence and moved to RAF Waddington from where it continues to operate. A Nimrod MR2, XV249, was identified as a suitable replacement and after a major overhaul at Kinloss the aircraft was ferried to BAe Woodford and stripped of all ASW equipment. After the installation of some antenna fairings, the aircraft was ferried to RAF Waddington on 19 Dec 96. When XW666 was lost the 3 Nimrod R1’s were in the middle of a major modification programme known as Starwindow. The project had been launched to equip the R1’s with a new Open Systems architecture digital SIGINT suite, probably based on those carried by the RC-135 Rivet Joint aircraft operated by the USAF. The Starwindow system incorporates two high-speed search receivers, a wide band digital direction finding system and 22 pooled digital intercept receivers. New workstations were fitted for the ‘specialists’ in the rear of the aircraft. The Starwindow installation on XV249 began on 27 Dec 96 and the aircraft eventually flew as a fully equipped R1 on 11 Apr 97. In addition to the Starwindow package the R1’s were also fitted with a new ‘Special Signals’ intercept facility with a digital recording and playback suite, an enhanced pulse-signal processing capability and multi channel digital data demodulator. A further equipment improvement programme to optimise Starwindow to the RAF’s operation procedures, known as Extract, is also believed to have been installed in the R1’s in the late 1990’s. The aircraft was operating on a post-maintenance test flight out of RAF Kinloss when both starboard engines caught fire. The aircraft was ditched into the Moray Firth. The crew was rescued within 10 minutes by an RAF Sea King helicopter. Parts were salvaged and the cockpit section is now on display at Aero Venture South Yorkshire Aircraft Museum in Doncaster.